Cream sugar and butter. Add eggs. Add remaining ingredients. Bake at 350 degrees: mini's 12 - 15 minutes; regular 25 - 30 minutes or until spring back when you touch the tops. Preheat oven to 350 degrees. Mix cake as directed on box. Pour batter into prepared cake pan. Spread rhubarb o top of cake batter. Do not mix into batter. Sprinkle sugar on top of rhubarb. Gently pour cream on top of rhubarb. Do not mix. Bake for 35-40 minutes or until cake tests done. Toss ingredients together. Spread on cookie sheet lined with parchment paper or aluminum foil. Bake at 350 degrees for 30 minutes or until potatoes are tender. In a medium bowl, mix flour, butter and confectioners sugar until a dough forms. Spray bottom and sides of a 9 x 13-inch pan with cooking spray. Press dough into bottom of pan. Bake at 350 degrees for ten minutes. While crust bakes, whisk together eggs, sugar, flour and salt in a large bowl. Stir in rhubarb to coat. Spread evenly over baked crust when crust comes out of oven. Bake for an additional 35 to 45 minutes until rhubarb is tender. Cool and cut into squares. Makes 15 servings. Place all ingredients in a medium saucepan. Bring to a boil. Cover and simmer until onions are soft. Cover until simmering. Uncover and simmer until thickens. Chill. In a large bowl, mix flour, pecans, baking powder, salt and nutmeg. In a small bowl dissolve soda in buttermilk. Add to flour mixture along with eggs, oil, sugars and vanilla. Mix just until moistened. Fold in rhubarb. Place in greased bread pan(s). Bake at 350 degrees 40 - 45 minutes. Makes 2 small loaves or one large loaf. Serve with Curry Cream Cheese Spread. Mix and spread on lefse. Enjoy! Simmer until tender. Cool. Strain or run through food processor. Add orange juice and ginger ale to taste. 1st Place 2017 Contest Winner! Chelsey doesn't give out her recipe, but there's plenty more at The Bite of Lanesboro! 2nd Place 2017 Contest Winner! Roast red, yellow, orange and green peppers on high heat. Also roast corn on high heat. Cut serrano peppers in half and remove seeds. Finely chop rhubarb, tomatoes, cilantro, serrano peppers, red onion, green onions and roasted peppers. Mix all ingredients in a large bowl. Add salt to taste. Let salsa rest for at least 1 hour to marinate. Put salsa in refrigerator. Enjoy as chips and salsa or you can add it as a side to grilled chicken, fish or tacos. 3rd Place 2017 Contest Winner! 1) Using a large sauce pan (4 quart pan) fill the pan with fresh cleaned garden rhubarb cut into 1-2 inch rhubarb pieces to make into sauce. You will need 1 cup of sauce for the ice cream. Using the filled 4 quart sauce pan will make approximately 3 cups of rhubarb sauce. 2) Add 1/3 of a cup of water to start making the cut rhubarb pieces into sauce. Boil it down until it is all rhubarb sauce and all the cut pieces of rhubarb are dissolved. 3) Add 1 cup of white sugar to the taste you want--which is going to vary by the rhubarb used and how you like it. 4) Next add one teaspoon of vanilla to the sauce. 5) Drain the rhubarb sauce so all the liquid is removed. The last time I did this I ended up with 3 cups of drained rhubarb sauce. You need one cup for the ice cream so the recipe can be adjusted according. I just keep the extra sauce for more ice cream or some other rhubarb dish to share. 6) Prepare ¾ cup of Essential (Cub) semi-sweet chocolate chips by placing the chocolate chips in 3 plastic quart size plastic bags. Go to the workshop and get a hammer and a 12-18" 2x4 and hammer the heck out of the chocolate chips to make them into small pieces. You will then need to break some of them apart because they will be too large. Set aside. 7) Mix the rhubarb sauce and one pint of heavy whipping cream along with ½ cup of sugar in a bowl before putting in into the ice cream maker. Fix the ice cream maker so it is ready to go with the ice, salt and water. Next put the smashed chocolate chips into the container and turn on the ice cream maker. When the ice cream is firmed up—stop the ice cream maker and store in a container in the freezer. Makes approximately one quart. Enjoy! Why is the ice cream named Bill's? I had a college roommate who loved ice cream. While he was on hospice he would suggest various flavors of homemade ice cream to make. Unusual flavors, muskmelon, watermelon, etc. and we would go out on the internet and see if we could find a recipe. One night he suggested rhubarb ice cream. The chocolate was an addition but he would have loved it. Bill is no longer with us but the ice cream lives on. Simmer until rhubarb is fully cooked. Strain when cool. Save the rhubarb pulp for another use. Store rhubarb syrup in the refrigerator until well chilled. Before serving, mix 1 cup rhubarb syrup with 1 quart cranberry juice and 1 quart gingerale. Remember to mark the 2017 Christmas Inn Tour on your calendars. The tour is December 3 from 2 to 6 p.m. Information, including how to order tickets, will be posted on the Lanesboro.com website. Preheat oven to 375 degrees and grease a 9"x9"pan. Place rhubarb, sugar, flour, lemon juice and salt in a large bowl and toss until rhubarb is evenly coated. Place rhubab mixture in pan. Place topping ingredients in a medium bowl and mix with a fork until evenly crumbly. Sprinkle topping over rhubarb. Bake 40-45 minutes or longer until rhubarb is soft and juices bubble through topping. Combine rhubarb and sugar in medium saucepan. Cover and cook over low heat until it starts to simmer. Uncover and cook until you like the consistency. Combine rhubarb, sugar, water and lemon juice in a large pan. Cook over medium heat approximately 15 minutes until mushy. With a strainer, drain, save juice and discard pulp. While still warm, add strawberry gelatine to juice. Put into containers and store in freezer. To serve, scoop frozen mixture into glasses. Add sparkling beverage to taste. 1st Place 2016 Contest Winner! To prepare the rhubarb, cut into 1/2-inch pieces, wash, put in a pot, pour enough boiling water to cover and put a lid on the pot. Let it sit until the color changes and the rhubarb is soft to the touch. This blanching does two things; first it removes some of the acid so it will require less sweetener and second it will be easier to puree. Drain rhubarb and puree in a blender. Put 4 cups on a lightly oiled leather sheet and dry until it can be crumbled or ground into flakes. This may take several hours. When the rhubarb sauce is dry either crush by hand or give it a twirl in a blender. Put meat and salt into a bowl and use a potato masher to force the salt into the meat. Combine onions with remaining 2 cups of rhubarb puree, rehydrate 10 minutes and then add the remaining ingredients. Thoroughly mix the flavored meat with the dried rhubarb. Put in a covered container or a self-sealing plastic bag. If marinating longer than one hour, place in the refrigerator. Because cold meat is harder to put through a jerky gun, let the mixture warm up for a few minutes before forming into strips and putting in a drying environment. 2nd Place 2016 Contest Winner! Combine rhubarb with sugar and bring to gentle simmer. Set aside while rhubarb is still firm. Saute celery, onion and garlic gently and mix with rest of dressing ingredients. Place in a well-buttered casserole and pour the rhubarb mixture evenly over the dressing. Bake covered at 350 degrees for 40-50 minutes depending on the size of the casserole. Pleasant change with pork or poultry! 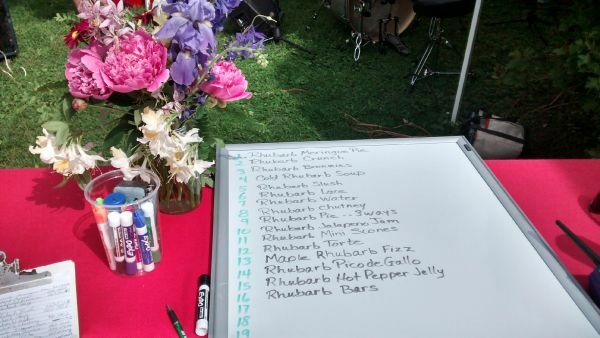 I served at the Rhubarb Fest as a main dish with some slices of roast turkey and accompanying gravy over the top. 3rd Place 2016 Contest Winner! Combine all and mix until texture of small pieces. Make sure butter is completely mixed in. Then press into a 9" X 13" pan and bake for 15 minutes at 350 degrees. In a large stainless steel saucepan, combine apples, sugar, rhubarb, water and lemon zest and juice. Bring to a boil over medium-high heat, stirring constantly. Reduce heat and boil gently, stirring frequently, until thick enough to mound on a spoon, about 15 minutes. Meanwhile, prepare canner, jars and lids. Ladle hot chutney into hot jars, leaving 1/2 inch headspace. Remove air bubbles and adjust headspace if necessary, by adding hot chutney. Wipe rim. Center lid on jar. Screw band down until resistance is met, then increase to fingertip-tight. Place jars in canner, ensuring they are completely covered with water. Bring to a boil and process for 10 minutes. Remove canner lid. Wait 5 minutes, then remove jars, cool and store. For good-textured chutney, choose from firm cooking apples that keep their shape during cooking, such as Golden Delicious or Spartan. When boiling sauces, chutneys and salsas that thicken as the moisture is evaporated, you may need to gradually reduce the heat to maintain a low boil and prevent scorching. Preheat oven to 350 degrees F. Grease an 8X4 inch loaf pan. In a large bowl, whisk together the flour, baking soda, salt and cinnamon. Stir in the brown sugar, oil, buttermilk, egg and vanilla, combining thoroughly. Fold in the rhubarb and pecans. Pour the batter evenly into the prepared loaf pan. Bake for 50-55 minutes, until a toothpick inserted into the center comes out dry. Let cool in pan slightly, then cool completely on a rack before slicing. Bake at 350 degrees for 45 to 50 minutes. I bake this in individual serving dishes rather than a baking dish. It makes 10 to 12 servings. I have substituted gluten-free flour to make this gluten free for our guests. This is served as a third course at our breakfast table with a dollop of whipped cream on top. Mix together. Reserve 2 Tablespoons to sprinkle on the top. Pat remainder in a 9X9 inch pan. Bake at 350 degreed F for 10 minutes. Cool. Dissolve cornstarch in water and add food coloring (if desired.) Combine sugar, cornstarch, water and Rhubarb in large sauce pan and cook on stove top, stirring until thickened. Reduce heat and cook 2-3 minutes. Spread on cooled crust. Prepare pudding as per package directions and spread over all. Sprinkle tip with reserved graham crumb mixture. Chill. Better if cooled over night. Simmer rhubarb, cornstarch and sugar in a medium saucepan, stirring constantly, until thick. Add vanilla and cool slightly. Set aside. Mix remaining ingredients in a medium bowl. Pour 3/4 of oatmeal mixture in a 9 X 13-inch pan and pat down. Cover with Cooked thubarb filling. Top with remaining crumb mixture. Bake at 350 degrees for 35 minutes or until brown. Makes 15 servings. Recipe taken from Everything Rhubarb. Place rhubarb in a 9X13 inch pan. Sprinkle sugar over rhubarb. Mix all ingredients with a fork until crumbly. Sprinkle over rhubarb. Boil juice. Pour boiling juice over all. Sprinkle with sugar. Bake at 350 degrees for 50 - 55 minutes. Makes about seven 8-ounce (250 ml) jars. Using a vegetable peeler, remove peel from half of one orange. Cut peel into very thin slices, about 1 inch long, and set aside. Squeeze juice from both oranges into a measuring cup, adding water if necessary, to yield one cup. In a large, deep stainless steel saucepan, combine orange juice, slivered orange peel and rhubarb. Whisk in the pectin until dissolved. Bring to a boil over high heat, stirring frequently. Add sugar all at once and return to a full rolling boil, stirring constantly. Boil hard, stirring constantly, for 1 minute. Remove from heat and skim off foam. Ladle hot jam into hot jars, leaving 1/4 inch headspace. Remove air bubbles and adjust headspace, if necessary, by adding hot jam. Wipe rim. Center lid on jar. Screw band down until resistance is met, then increasee to fingertip-tight. Place jars in canner, ensuring they are completely covered in water. Bring to a boil and process for 10 minutes. Remove canner lid. Wait 5 minutes, then remove jars, cool and store. 1st Place 2015 Contest Winner! Put rhubarb mixture into an unbaked pie shell. Cover with topping. Bake at 400 for 10 minutes. Reduce heat to 350 and bake 30 minutes more. 2nd Place 2015 Contest Winner! Preheat oven to 350. Spray a 9x13 pan with cooking spray. Crust: combine all crust ingredient. Mix until crumbly. Reserve 1/3 of the mixture. Press remaining crust mixture into 9 x 13 pan. Bake 10-12 minutes or until lightly browned. Prepare filling while crust is baking. Filling: In large mixing bowl beat eggs. Mix flour, salt and sugar together in separate bowl. Pour over eggs and blend well. Then add vanilla and rhubarb. Blend well. Pour mixture over partially baed crust. Sprinkle remaining rust mixture over top of rhubarb mixture. Continue to bake for 30-35 minutes. Cool. Store leftovers in refrigerator. 3rd Place 2015 Contest Winner! Cube croissants into 1" pieces. Toss with candied rhubarb and pour into a buttered 9 x 13 glass baking pan. Combine sugar, cream, eggs, zest and salt and mix well. Pour over the croissants, poking pieces down into the egg mixture. Let stand to allow liquid to be absorbed. Bake until the bread is puffed and knife inserted comes out mostly clean (approximately 45 minutes). Serve warm. For a special treat, top with rhubarb sauce and vanilla ice cream. Mix dry ingredients, then add to moist ingredients. Mix batters 1 and 2 separately, then combine. Using 1/2 the batter, spread on bottom of 9X13 pan (greased and floured.) Spread rhubarb over batter and sprinkle raisins. Lightly sprinkle sugar over fruit then cover with the rest of the batter. Pop into 350 degree oven for 45 minutes or until golden brown. Cook on high 8 hours. Heat on high until thick. 1 package strawberry gelatin (dry), 3 oz. Combine rhubarb, marshmallows, gelatin and sugar. Spread in bottom of greased 9X13 pan. Combine the melted butter and dry cake mix, and sprinkle on top of rhubarb Mixture. Pour the water over all. Bake at 350 degrees for one hour. Serve with ice cream or Cool Whip. Stir until crumbly. Pat 2/3 into greased 9X13 pan. Bake 10 min at 375 degrees. Dissolve 5 Tblsp cornstarch in 1/4 cup water in a medium saucepan. Cook until thick. Cool. Pour over pre-baked crust. Crumble remaining 1/3 topping over all. Bake 30 min at 375 degrees. 1) Combine rhubarb, 2 Tblsp sugar and enough water to cover in a medium saucepan. Bring to a boil over high heat. Reduce heat. Simmer for 30 minutes, stirring occasionally. Strain. Reserve 1 cup of juice. Discard pulp. 2) In the bowl of a food processor finely chop peppers and onions. 3) Combine rhubarb juice, peppers, onion, vinegar and sugar. Bring micture to a boil, stirring constantly. Boil hard for one minute. Remove from heat. Stir in pectin. 4) Use basic canning procedure, cooking for 10 minutes. 5) During cooling process, distribute solids. Cook fruit, salt and orange juice in 4-6 quart pan, stirring as it gets to the boiling point. Boil 1 minute. Add pectin and stir until it reaches a fast boil. Add sugar, stirring well. Bring to a fast boil. Boil 1 minute. Remove from heat. Skim off foam. Pour into prepared jars and seal. Place rhubarb in a heat-resistant bowl. Pour boiling water over it and let sit 10 minutes. Drain. Place rhubarb, sugar and cinnamon in a blender and puree until smooth. Spread evenly on a lightlyl oiled solid leather sheet and place on a drying tray. Dry in food dehydrator at 135 degrees for 8-12 hours. Leather is done when it peels easily from the sheet. Cut into strips. Stack pieces on top of one another and wrap securely in plastic wrap. Store in an airtight container at room temperature. Keeps for 1 year. Chill, mix and serve immediately. Scald cream. Combine flour and 1 c sugar. Stir in cream. Add vanilla, salt and egg yolks. Beat with egg beater. Put rhubarb in unbaked pie shell. Pour cream mixture over it. Bake at 350 degrees 30 minutes. Cover with meringue made of 2 egg whites and 1/4 c sugar beaten together. Put in oven again until meringue is nice and brown - about 15 minutes. Serves 6. Mix and press into 9 1/2 " pan. Bake at 350 degrees for 10 minutes. Pour into crust. Bake at 350 degrees for 45 minutes. Cook fresh rhubarb and sugar in 1/2 cup water until sugar is dissolved and rhubarb is soft. Add gelatin to this mixture and stir until dissolved. Stir in pineapple. Fold in strawberries and chill overnight. Pour Aronia concentrate over rhubarb. Mix to stain evenly. In big mixing bowl, sift together flours, salt, baking powder, soda and sugar. In food processor, grate frozen butter. Then insert food processor blade. Add flour mixture and pulse only enough to get butter distributed into fine crumbles. Pour flour mixture back into large bowl. Add rhubarb and toss to coat, separate rhubarb pieces and distribute. Make well in middle of flour-rhubarb mixture. Mix buttermilk, vinegar and zest. Add to flour-rhubarb mix. Work quickly to keep it cold, distribute moisture throughout and form a cohesive dough. Don't overwork. Cut rectangle into 6 or 8 squares. Cut squares in diagonals to make triangles. Sprinkle with large grain sugar if desired. Place on parchment lined, buttered baking sheet and bake 25 to 30 miniutes. Serve with rhubarb jam. Makes 12 - 14. Blend all for 3 minutes. Strain if you prefer no pulp. In a bowl, combine ingredients mixing well. Place about 1/8 cup of the filling on tortilla and place lettuce leaves on top before rolling the tortilla up jelly-roll style. Place the rolled tortilla, seam side down, on a tray and refrigerate until ready to serve. Cut each tortilla into 5 pieces and serve with pico de gallo. 1-2 jalapenos, finely diced. Seeds optional. Any type of hot sauce may be used as needed. Blanch the rhubarb after dicing, for 10 to 20 seconds and refresh in ice cold water. Drain well. Combine ingredients and refrigerate for 35-45 minutes before serving. More cilantro may be added as cilantro loses its pungency fairly fast. Pineapple, nectarines, peaches, plums or any fruit in season can be substituted for making pico de gallo. In the fall, try using any variety of apple. Inspired by Mark Bittman, and The Food Matters Cookbook. Bake at 350 degrees for 10mins. 1. Mix rhubarb with sugar and lemon juice. Place in a microwave bowl and microwave 2 minutes stirring every 30 seconds. Set aside. 2. Melt white morsels and set aside. 3. Mix graham crackers with melted butter. Press into and up the sides of a 10-inch spring form pan. Cover outside and bottom of pan with heavy aluminum foil. 4. In a large mixing bowl mix together cream cheese, sour cream, sugar and cornstarch. Whip until smooth. 6. Add eggs one at a time and beat after each addition. 7. Stir in cooled white morsels. 8. Spread half of the cream cheese batter on the graham cracker crust. 9. Spread half of the rhubarb mixture over the cream cheese. 10. Add the rest of the cream cheese mixture and finish off with rhubarb mixture. 11. Take a knife and swirl through mixture. 12. Bake at 350 degrees for 90 minutes to two hours or until edge of cheese cake is firm and center appears nearly set. 13. Cool 15 minutes. Remove foil. 14. Cool another 30 minutes and loosen sides of pan. 15. Refrigerate until ready to serve. Yield 12 – 14 servings. Cook fruit and sugar until desired consistency. Chill. Spoon over nonfat yogurt. Heat oven to 425 degrees. Prepare pastry. Stir together sugar, 1/3 cup flour, Jello, almond flavoring and rhubarb. Place in pastry-lined pan. Mix together brown sugar, oats, ¾ cups flour, butter and cinnamon. Cover with rhubarb and crumble mixture. Lightly sprinkle top with cinnamon. Bake for 40 to 45 minutes or crust is brown and juice begins to bubble. Mix. Bake at 400 degrees for 18-20 minutes. For glaze mix powdered sugar and orange juice. Cook until thick. Baste chicken wings or other meat several times with sauce while cooking or grilling. Beat all ingredients (except nuts, raisins and rhubarb) together in a large bowl until mixed. Stir in nuts, raisins and rhubarb. Put into a 9" x 13" x 2" pan and bake at 350 degrees until done. Boil until soft. Puree in food processer. 1. Heat oven to 350 degrees. In a large bowl mix butter and sugar until creamy. 2. Add eggs and vanilla. 3. Add combined flour, baking soda, cinnamon and salt. 5. In a sauce pan, soften chopped rhubarb, adding ½ cup brown sugar. 6. Spread half of batter in the bottom of a 9" x 13" pan. Spoon rhubarb over batter. Add the other half of batter on top. 7. Bake about 30 min. In a medium bowl, mix rhubarb, sugar, egg, flour and vanilla until well blended. Put rhubarb mixture into unbaked pie shell. In a small bowl, mix topping ingredients until crumbly. Cover rhubarb mixture with topping. Bake at 400 degrees for 10 minutes. Reduce heat to 350 degrees and bake 30 minutes or until done. Cut toast into pieces. Put into buttered 1 ½ quart dish. In a sauce pan scald milk and butter. Combine eggs, rhubarb, sugar, cinnamon and salt. Stir into bread mixture. Top with brown sugar. Bake at 300 degrees for 45 – 50 minutes. Cream butter and sugar. Add eggs, milk and vanilla. Sift dry ingredients and add in. Toss rhubarb lightly in a bit of flour and fold in. Fill cupcake cups half full. Bake at 350 degrees for 15 – 20 min. Place ingredients in a medium saucepan. Simmer until soft. In a large bowl, beat butter and sugars until creamy. Add eggs and vanilla. Beat well. In a separate bowl, combine flour, baking soda, cinnamon and salt. Mix well. Add oats and rhubarb. Drop onto a cookie sheet and bake at 375 degrees. Variation: Spread mixture on a greased 10-inch pie plate (or a 9 x 13 inch pan.) Bake at 375 degrees for ½ hour. Place rhubarb evenly in a 9x13 pan. In a large bowl, mix dry ingredients. Add canola oil and fork in. Sprinkle over rhubarb. Pour apple juice over top. Bake at 350 degrees for 50 – 55 minutes. In a small saucepan scald cream. In a medium bowl combine flour and 1 cup sugar. Stir in cream. Add vanilla, salt and egg yolks: beat with egg beater until well blended. Put rhubarb in unbaked pie shell in glass pan. Pour cream mixture over it. Bake at 350 degrees for 30 minutes. In a medium bowl make meringue by beating egg whites and ¼ cup sugar together until stiff peaks form. Cover rhubarb with meringue. Put in oven again until meringue is nice and brown, about 15 minutes. This recipe times five makes four 9" pies. This is Grandma Topper's recipe with a more modern twist made with 'fillo dough.' I've added "luttel" to also celebrate my Pennsylvania Dutch heritage. In a large bowl, mix all ingredients well and place in baking dish. Bake at 350 degrees for 15 minutes. While baking custard, spray mini muffin pans with cooking spray. Divide fillo dough sheet into six sections. Line each muffin cup with 2 to 3 sheets of dough. Brush 2nd and 3rd sheets with butter. Spoon partially baked custard into muffin tin and continue baking for 30 minutes. When slightly cool, remove from muffin tin. ENJOY! Makes 24. In a medium skillet, heat mustard seeds in oil until seeds pop. Add rhubarb, onion, chile, garlic, ginger, cumin and turmeric. Cook one minute. Add broth and red lentils. Cover and simmer 30 minutes. Stir. Simmer uncovered 20 minutes longer until creamy. In a medium saucepan, heat above ingredients on medium heat for 8-10 minutes. Strain liquid from pulp. Allow liquid and pulp to come to room temperature. In a medium bowl, beat egg whites, vanilla and cream of tartar to soft peaks. Slowly spoon rhubarb liquid into egg whites while continuing to beat. Beat to stiff peaks. Slowly fold in rhubarb pulp. In a small bowl, sift together sugar and flour 3 times. Add dry ingredients to egg whites. Grease an angel food cake pan. Pour batter into pan. Bake at 350 degrees for 45 to 50 minutes. Cool the cake upside down in the pan on a wire rack before removing from pan. Copyright © 2019 | Rhubarb Festival | Lanesboro, MN 55949 | All Rights Reserved.